Drawing done over period of combined lessons. Tailored to the attention span of a 6-8 years old. Students will use a variety of media, incorporate the Elements of shape, learn to see and draw realistically, and have the creativity to create their drawings with self expression. As our artists start drawing through the program they will learn techniques to see the world around them and translate this newfound vision into the two-dimensional world of drawing. 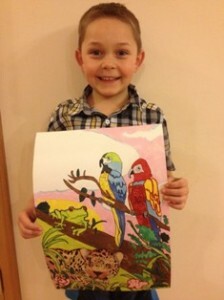 Children will draw from lessons that have a focus on geography, people, scenery, objects, animals nature and much more. When information is drawn it will be remembered forever. Increases more independent interpretation of instructions. Teaches use of a variety of mediums. As students read and talk about various cultures and history, they are motivated to draw objects, and people from other countries. During this activity they also take in information that they will connect with the drawing. When a person draws what they are learning about they will learn it 8 times faster and retain it 8 times longer.